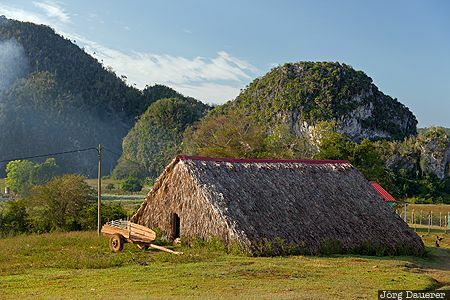 A typical reed hut in the tobacco fields of the Viñales Valley (Spanish: Valle de Viñales) with a wooden cart below a blue sky. Viñales is in the province Pinar del Río in the west of Cuba. This photo was taken in the morning of a sunny day in February of 2016. This photo is in the Photo Calendar "Kuba". This photo was taken with a digital camera.